At Mary's Miniatures we currently source miniatures from many vendors/manufacturers. This helps us bring you a wide selection of miniatures with well over 16,000 miniatures in our online catalog. This process, while it brings you great selection can delay shipping for some items. Note that since we ship all of your items together, your order will ship based on the longest lead time of items included in your order. We make every effort to ensure your satisfaction. We will first email you to acknowledge your order and will email you a second time when the order is shipped. We suggest you consider purchasing package insurance when checking out, as it's an inexpensive safeguard against lost, stolen and damaged shipments. We are not responsible for lost, stolen and damaged packages which are not insured. If you have had issues with stolen packages in your neighborhood or your mail carrier delivers packages in an easily veiwed location, we strongly suggest you purchase signature confirmation to prevent theft. Please be certain when checking out that your delivery address is both accurate and valid. International shipping customers if ANYTHING odd happens when we ship your order, we will contact you via email. Please make sure to provide a valid email address. Unless all of the items in your order are a 1 business day ship lead time, expedited shipping is not possible. Orders can be cancelled in the first 24 hours for free, after 24 hours AND before we ship cancelled orders are assessed a 20% restocking fee on ONLY the products we are charged to restock from the vendor. Shipping is refunded fully. We ship USPS and each address is validated and formatted by the US Postal Service, please be certain your address is accurate as we are not responsible for misdirected packages due to an improper mailing address. Our postal software will automatically attempt to match your supplied address to a valid one, but there are no guarantees this will be appropriate. When in doubt, check with your post office. Orders over $200.00 will be sent with either Signature Confirmation or Shipping Insurance depending on your location. This is a required process from the credit card companies and PayPal. If your order totals $100 or more then there is free shipping on MOST items. To determine your exact shipping cost at any time, simply add the item to your cart, there is no need to create an account or supply any contact information to check your shipping cost. 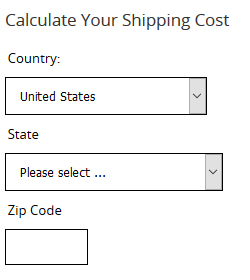 Once the item(s) are in your cart, visit the shopping cart page and use the "Calculate Your Shipping Cost" form pictured below. There is NO information collected except your sate and zip code to get the total of your shipping. We realize sometimes things are the wrong color, size or just not quite right for your project. So you can return ANY resalable item to us for a marysminiatures.net store credit. Shipping to you and returned shipping costs are not credited, nor refunded in any way. 1. The item(s) MUST be in a unopened/resalable condition. We reserve the right to add a 15% restocking fee if the item(s) are not in resalable condition. Non-miniature books cannot be returned. 2. You MUST address your package including the RMA number like below and include this packing slip. 3. You must return the product within 10 days from the date of delivery to you. Packages received postmarked after 10 days have expired will be refused. 4. Sales tax, postage to/from and other non-product cost cannot be credited. 5. There are NO RETURNS/EXCHANGES/REFUNDS ETC on special orders at all. 6. Once we receive your returned item(s) we will process them and issue a store credit to the email address used on the original purchase. Returns not shipped correctly via the address provided or postmarked more than 10 days from your receipt of the order will be refused.